NEW ORLEANS – You might find it hard to believe, but the 2018 collegiate cross country season is about to enter its second full month. As fast as this season is going, the athletes running in the meets are going even faster. Here are 10 athletes that caught the attention of the USTFCCCA Communications Staff this past weekend and were named National Athletes of the Week on Monday by the Association. Amon Kemboi held off Syracuse’s Aidan Tooker and captured the individual title at the Coast-to-Coast Battle in Beantown this past weekend. Kemboi sprinted down the homestretch three tenths of a second ahead of Tooker, who helped pace the Orange to the team title. The sophomore from Kapsabet, Kenya, grabbed individual glory, however, crossing the finish line in a time of 24:02.2. This is the continued rise of Kemboi, who earned First-Team All-America accolades during both the indoor and outdoor seasons in track & field. Kemboi finished fifth in the outdoor 5000 and eighth in the indoor 5000, not to mention a 29th-place effort in cross country. 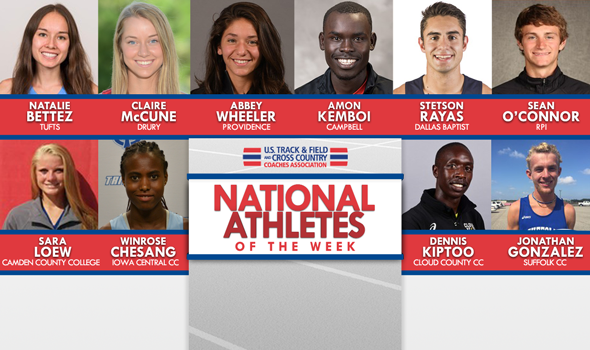 Kemboi joins Lawrence Kipkoech as the only athletes in Campbell program history to be named National Athlete of the Week in cross country. Abbey Wheeler stepped up for Providence this past weekend at the Coast-to-Coast Battle in Beantown. The 11th-ranked Friars opened the season against three other teams that were ranked in the most recent NCAA Division I Women’s Cross Country National Coaches’ Poll: No. 22 Syracuse, No. 24 Minnesota and No. 27 Dartmouth. Wheeler cruised to the individual title and was the only Providence runner in the top-25. She led by as many as 16 seconds at the two-mile split and won by nine seconds over Bethany Hasz from Minnesota. She joins Brianna Ilarda as the only athletes to be named National Athletes of the Week in cross country in program history. Stetson Rayas was named a National Athlete of the Week after the senior finished fifth overall at the Chile Pepper Festival this past weekend. The El Paso native posted a mark of 24:30.3 on the 8K course to finish as the fourth-best collegiate and top Division II athlete at the meet. Rayas is the first male and just the second athlete in program history from Dallas Baptist to ever get selected for the honor. Claire McCune was picked as a National Athlete of the Week after the sophomore finished eighth overall at the Chile Pepper Festival with a 17:28.6 performance for the 5K course. With two unattached runners ahead of her, McCune finished as the sixth-best collegiate and top Division II athlete at the meet. McCune is the first athlete in school history to get selected as a cross country National Athlete of the Week. Sean O’Connor made his season debut in a big way. O’Connor opened his senior year with a win at the Purple Valley Classic, hosted by Williams. He crossed the finish line in 25:44.7 and won by nearly six seconds over Plymouth State’s Sam Brunnette, who has received several nominations for National Athlete of the Week this season. The fourth-ranked Engineers used O’Connor’s individual title and three other runners in the top-10 to seal the team title in a loaded field. There were six other teams in the race that were ranked in the most recent NCAA Division III Men’s Cross Country National Coaches’ Poll. This is the first time that both O’Connor and the RPI program has been awarded a National Athlete of the Week honor in cross country. Natalie Bettez picked a great time to nab the second individual title of her collegiate career in cross country. Coincidentally, it came just one week after her first. Bettez cruised to a near 10-second win at the Purple Valley Classic, which featured athletes from six teams that were ranked in last week’s NCAA Division III Women’s Cross Country National Coaches’ Poll. She covered the 6K tract in 22:06.9, well ahead of runner-up Kaitlyn Mooney of Coast Guard, who finished fourth at the NCAA Cross Country Championships last year. Tufts combined Bettez’s performance with several others to finish third in the team standings and upset several teams that were ranked ahead of it last week. This is the first time that both Bettez and the Jumbos have earned a National Athlete of the Week honor in cross country. Dennis Kiptoo took home the National Athlete of the Week honor for the third consecutive week to open the season after he finished seventh overall at the Chile Pepper Festival. The freshman from Kenya posted a time of 24:37.3 for the 8K course. Winrose Chesang was named National Athlete of the Week after the freshman finished 16th overall at the Chile Pepper Festival with a 17:57.1 performance. She was the top JUCO runner at the meet along with coming in as the 14th-best collegiate. It is the 20th National Athlete of the Week honor for an Iowa Central CC athlete during the cross country season. Jonathan Gonzalez picks up a National Athlete of the Week award after he finished third overall at the LIU Post Cross Country Invitational with a 23:33.6 showing on the 7K course. It is the seventh National Athlete of the Week honor in program history and Gonzalez is just the fourth male athlete from Suffolk to win the honor during the cross country season. Sara Loew is National Athlete of the Week after she took fifth-place at the Osprey Open this past weekend. The freshman posted a time of 25:16.0 over the 6K course. Loew is the first athlete from Camden County to be named a National Athlete of the Week in school history.